Andrew Brimmer started volunteering with Read Ahead in 2011 and quickly became even more involved in our mission through Friends of Read Ahead, our young professionals committee. 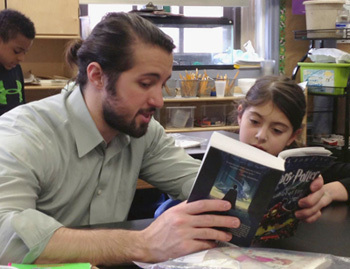 Andrew brings an inspiring amount of enthusiasm to his work with his student, Sofia, who is visibly thrilled when he arrives each week to read with her. As Co-Chair of Friends, Andrew was instrumental in making this year’s Strikes, Spares, and Splits bowling fundraiser a success and was the top fundraising individual—singlehandedly raising over $3,500 for Read Ahead! What inspired you to start volunteering with Read Ahead? I had done a lot of volunteering in the past, mostly as a mentor in college for 6th and 7th grade students. Read Ahead was a great way to get back into volunteering as an adult and still manage my work. I love to read and didn’t have the opportunity to read enough at my last job, so it was a nice escape for me, to spend time during the workday reading with someone else who enjoys it as much as I do. What’s the most rewarding part of the experience? The most rewarding thing I’ve found is the genuine excitement that the students show after you spend some time with them. They may not feel comfortable with you at first—with reading out loud or discussing books they’ve read—but over time you really see growth. It’s so nice to see their excitement over what they’re reading and see how they assess each book you read together. For example, Sofia, who I read with now, loves Diary of a Wimpy Kid and Dear Dumb Diary—she’ll compare the styles of each author and tell me about how one author focuses more on peer relationships, where the other focuses more on school and homework. It’s so fun to see how excited she gets about it. You’ve been reading with Sofia since 2013—have you seen any changes in her over the time you’ve spent together? At first Sofia had no desire to read out loud. It made her uncomfortable when she would stumble over words or didn’t know what certain words meant. Now she has this confidence in reading out loud—if she gets to a word she doesn’t know or understand, she’ll just read it and ask me about it. I’ll give her some context clues and she’ll figure it out and keep reading. It’s been really cool to see that transition in her. TGIF: Andrew and Sofia take a break from reading and celebrate the end of the week. Are there any strategies you use during your time together? Establishing the relationship early on is important, just making sure they’re comfortable with you. Whenever I arrive for a reading session with Sofia, I won’t jump right into the book. I’ll ask her how her weekend was, how school is going, what’s going on in her life. That gets us more comfortable, into a place where I’m not a teacher, but a mentor and a friend. Then she’s much more willing to be a part of the reading process, rather than just being a student. I also always ask her what she’s reading and encourage her to read outside of the program—and she always is, which is great. She asks me tons of questions about the books I’m reading and loves hearing all the details. She’s excited knowing that I’m reading too, so it becomes a shared experience. Is there a book you’ve read together that has been particularly successful? Sofia started reading the Harry Potter books in 2nd grade and it’s really amazing how she has a strong grasp of the plot and character development at that age. It’s impressive and exciting that she’s challenging herself. Read Ahead is a great because there are such different students in the program. The first student I read with was only interested in nonfiction. I usually prefer fiction, so I started off trying to get him to read about wizards or dragons, but he just wasn’t interested. So we ended up learning about caterpillars, astronomy, dinosaurs… You name it and we read about it and learned together.